Mississippi Coast Coliseum and Convention Center in Biloxi, Mississippi. Early fall is the perfect time of year to bring the family down to the Gulf Coast to enjoy the cruise-in, oldies music, and other classic car themed fun. The entire week leading up to the auction will have music and events to celebrate classic cars and the culture that goes along with muscle car appreciation. The auction provides the perfect opportunity to acquire your own personal dream car. The Vicari Classic & Muscle Car Auction is being held from Thursday October 5th through Saturday October 7th. The Cruise-In will be held in the days leading up to the auction. Tickets for entry to the auction are $15. Children 10 and under will be admitted free of charge. The event will also have a swap meet throughout the weekend with different car parts and accessories. Live music from different genres will be featured throughout the day to keep the entire family entertained. Cruisin’ the Coast is a large block party featuring classic cars and muscle cars from many different decades. This is a family friendly event that provides an excellent way to introduce the kids to the world of antique cars. This auction will feature many different types of cars at different values, making it ideal for those looking for a hobby car or an investment. It’s also a fun event for those who simply enjoy looking at classic cars and interacting with other car enthusiasts. For those who wish to bid on a car, the bidder’s fee is $100. The bidding registration can be completed online through the Vicari Auction website. One of the highlights of the auction is a 1963 Batmobile. There are expected to be around 700 cars up for auction at this event. The auction will begin on Thursday at 10:00 AM, and on Friday and Saturday at 9:00 AM. Information and pictures of many of the cars that will be up for bid can be found on the Vicari Auction Company website. 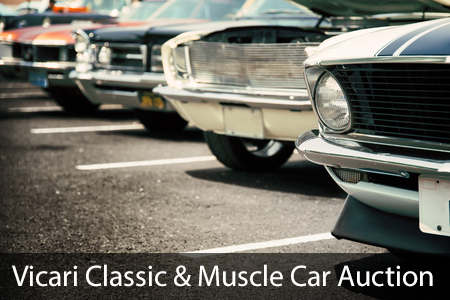 The Vicari Classic & Muscle Car Auction is a 3 day event that has activities going on throughout the entire day. Car enthusiasts will appreciate being able to see many different makes and models of cars. Many of the cars at auction are ready for your next road trip, while others will make a great project for the at-home mechanic. This event is family-friendly and will also feature live music, a swap meet, and other activities each day. The auction begins on Thursday, October 5th, and runs through Saturday, October 7th. If you’re in the Gulf Coast area during this week, be sure to head over to the Mississippi Coast Coliseum and Conference center for a fun car-centered event for all ages.